It’s an exciting time to be a member of the Green Party. 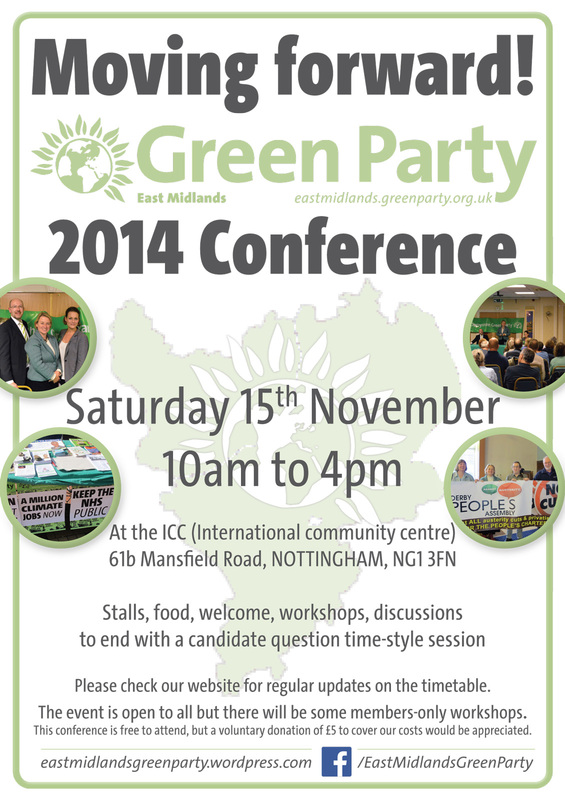 Our membership has grown to record levels, and on November 15th, the East Midlands Green Party are holding our first Regional Conference. The venue is the International Community Centre in Nottingham. Admission is free but a voluntary donation of £5 would be appreciated. There is no requirement to book in advance. There is a session for new members at 11:00 to help you to find your way around the Green Party and to answer any questions that you might have about anything to do with the Party. Also, the local BBC network will be in attendance, and they will be looking to interview a selection of newer members, to help them to understand why people are joining the party. If you are a new member who would be prepared to be interviewed for this piece, please could you let me know as soon as possible, and I will ensure your details are passed on. It will be a great opportunity to network across the local party, to pick up campaigning tips ahead of next year’s elections and to speak to 2015 Election Candidates. If you are travelling from out of town, the venue is around a mile from the rail station, and is just over half a mile from the Lace Market or Old Market Square Tram stops. You can find Park & Ride details here. It should be a fantastic day, and it will be even better if you can help us to make it so. On behalf of the EMGP committee, I look forward to seeing you there. Steve Miller, Membership Secretary, East Midlands Green Party. This entry was posted in East Midlands, International, National and tagged Green Party, Meetings. Bookmark the permalink.